My kids are always looking for new toys. Ones that can attach to their bodies are even better since they can show off other skills or play to their little friends. Mommy Moments with Abby's review of Shoulder Buddies: When I first saw this little guy my thoughts instantly were reminded of those troll dolls I had when I was a kid. I knew my daughter would love the hair on these little guys! I thought is was really cool that these guys could sit right on her shoulder using magnets. It made for a great conversation about magnets and how they work. Then my daughter could set about showing her new buddy how to color, ride a bike, and dance like a ballerina. The smart card is great for teach-able topics. We were excited to see what her Smart Card would say and she made sure to teach her "Smarts" to her newest friend! She was so excited that her Shoulder Buddy could go with her by attaching to her shoulder to help her teach her new "Smarts" to her friends! These are great stocking stuffers! Maybe you have a little one who is learning a new skill? Like to play an instrument like the piano, this little guy can help them out by watching over their shoulder so they can learn too! Check out this product on their social media networks: Facebook and Twitter. Shoulder Buddies are adorable, wearable characters that come with "Smart Cards" that share valuable life lessons. Kids love to collect and wear their Shoulder Buddies, while learning about the great messages that come with them! 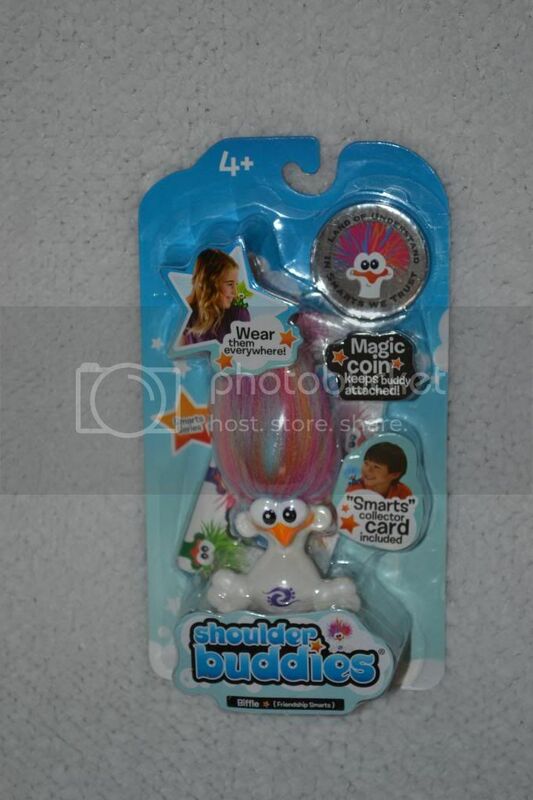 Each Shoulder Buddy figurine is approximately 4 inches high with fuzzy fluffle hair and 1.5 inches wide. Contains inaccessible magnets. The Magical Coin is a covered metallic coin that attracts to the magnet. Manufactured under license by The Bridge Direct. Each sold separately, subject to availability. Colors and styles may vary as we continue to modify and improve our products. Made in China. The Bridge Direct products are safety tested and comply with ASTM F963. Ages 4 and up.